UCLA head baseball coach John Savage and the University have agreed to another contract extension that will run through 2017, athletic director Dan Guerrero announced today. This new extension is an amendment to the extension that Savage signed back in 2011, adding two more years to the previous deal that was scheduled to run through 2015. 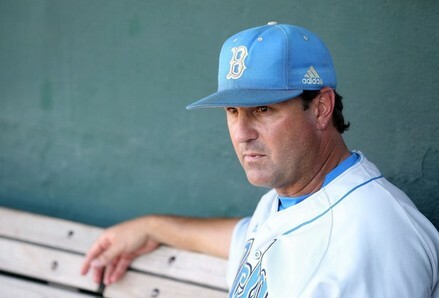 Entering his ninth season at the helm of the UCLA Baseball program, Savage has led the Bruins to six NCAA Tournament appearances in the last seven years and guided the program to College World Series appearances in 2010 and 2012. He also coached the Bruins to Pac-12 Championships in 2011 and 2012, marking the first time in school history that UCLA has won back-to-back conference titles. This past spring, Savage coached the Bruins to a 48-16 record and a No. 2 national seed in the NCAA Tournament, the highest seed the program has ever received. In 2011, he led UCLA to its first outright conference title since 1986 and saw right-handed pitchers Gerrit Cole and Trevor Bauer get drafted No. 1 and No. 3 respectively in the 2011 MLB Draft. Under Savage’s coaching, Bauer also became the first UCLA ballplayer to earn the Golden Spikes Award, given out annually to nation’s top amateur player. Savage is one of just eight coaches in the history of college baseball to have led his team to a College World Series, produced a No. 1 overall MLB Draft selection and coached a Golden Spikes Award winner. In 2010, UCLA won a school-record 51 games and advanced to the finals of the College World Series for the first time in program history. Savage is also the first head coach at UCLA to lead the baseball program to three consecutive postseason appearances, achieving the feat twice (2006-08, 2010-12). In addition, Savage has continued to bring in outstanding recruiting classes at UCLA, with seven of his eight recruiting classes being nationally ranked in the top 20 by Baseball America. Earlier this fall, Savage brought in the No. 2 ranked recruiting class in the country for the 2013 season. UCLA has continued to succeed in the professional ranks under Savage as well. In his eight seasons as UCLA head coach, 58 Bruins have been selected in the Major League Baseball Draft. Six of Savage’s former players at UCLA (pitchers Hector Ambriz, Bauer, Tyson Brummett, David Huff and Josh Roenicke and shortstop Brandon Crawford) have played in the Major Leagues.